While I can certainly appreciate the quality of the writing, I am, alas, somewhat prone to “unweaving the rainbow” myself. If we stripped away the lyrical writing, what would we be left with? To be more precise, what kind of argument would we be left with? It seems to me that Dawkins is indeed trying to present some kind of argument: he has conclusions that he wants us to accept. Specifically, he wants us to be consoled by the fact that we are going to die; to stop whining about our deaths; to stop fearing our ultimate demise. And this is all because we are lucky to be alive. In this respect, I think that what Dawkins is doing is analogous to what the classic Epicurean writers did when they tried to soothe our death-related anxieties. But is his argument any good? That’s the question I will try to answer. In days of old, we felt no disquiet... So, when we shall be no more — when the union of body and spirit that engenders us has been disrupted — to us, who shall then be nothing, nothing by any hazard will happen any more at all. Look back at the eternity that passed before we were born, and mark how utterly it counts to us as nothing. This is a mirror that Nature holds up to us, in which we may see the time that shall be after we are dead. How do the premises of this argument work? Let’s start with premise (1). The implication contained in the premise is that we should be grateful for the opportunity of being alive, even if that entails our deaths. This suggests that the argument is an argument from gratitude. He is telling us to be grateful for the rare privilege of dying. The problem I have with this is that gratitude has a somewhat uncertain place in a non-religious worldview. Gratitude is typically something we experience in our relationships with others. I am grateful to my parents for supporting me and paying for my education; I am grateful to my friends for buying me an expensive gift; and so on. If we think of our lives as being gifts from a benevolent creator, then being grateful, arguably, makes sense. But Dawkins is, famously, an atheist. So he must be relying on a different notion of gratitude. He must be saying that we should be grateful to the causal contingency of the natural order for allowing us to exist. But this seems perverse. The natural order is impersonal and uncaring: it just rolls along in accordance with certain causal laws. Why should we feel grateful to it? This same natural order is, after all, responsible for untold human suffering, e.g. suffering from natural disasters, viral infections, cancer and other unpleasantries. These are facets of the natural order that we tend not to accept. In fact, they are things we generally try to overcome. Why should we feel grateful for being plunged into a life filled with suffering of this sort? Couldn’t it be that death is one of the facets of life that we should use our ingenuity to overcome? I have been blogging for nearly five years (hard to believe). In that time, I’ve written over 650 posts on a wide variety of topics: religion, metaethics, applied ethics, philosophy of mind, philosophy of law, technology, epistemology, philosophy of science and so on. Since most of my posts clock-in at around 2,000 words, I’d estimate that I have written over one million words. I also reckon I spend somewhere in the region of 10-15 hours per week working on the blog, sometimes more. The obvious question is: why? Could it be the popularity? Well, I can’t deny that having a wide readership is part of the attraction, but if that’s the reason then I must be doing something wrong. The blog is only “sort of” popular. My google stats suggest that I’ll clear 1,000,000 views in the next month and half (with a current average of 35,000 per month). My Bravenet counter suggests I’m still languishing in the low 700,000s. Since that is the more conservative estimate, I’m guessing it is closer to the truth, though for some reason it doesn’t always count hits I get from reddit (incidentally, I’d like to thank reddit user Snow_Mandolaria — whoever you are — for regularly linking to my blog on there). These aren’t insignificant figures, but they aren’t hugely impressive either (I should add, though, that I get many more readers from reposts of my material on other websites, particularly the IEET page). But if it’s not the popularity, what could it be? There are two answers to that. The first is that I genuinely enjoy reading about interesting topics, trying to analyse and understand them, and then sharing my analysis with others (however many of those others there may be). The second is that I think blogging has been (enormously) beneficial to me in my work as an academic. Most of my colleagues are sceptical about this. 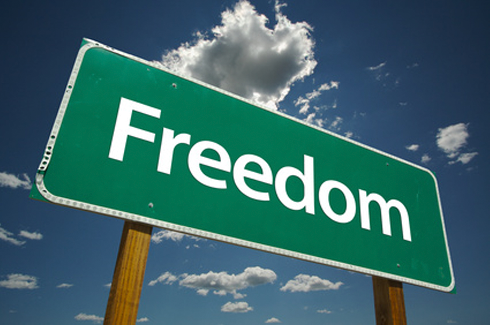 They tend to think that the time spent on this blog represents a significant opportunity cost. 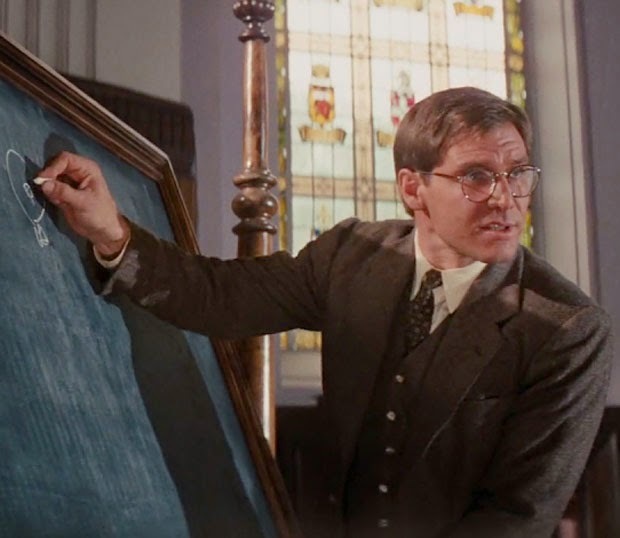 For better or worse, the incentive-structure in modern academia is geared around publishing high-quality, peer-reviewed publications (and also, though to a lesser extent, about high-quality teaching). The time I spend churning out blog posts could be spent working on publications for peer-review. Imagine if instead of writing one million words-worth of blog posts I had written one-tenth as many words for peer review. That would represent a significant number of peer-reviewed publications (maybe as many as ten). They also tend to think I don’t specialise enough in what I write about on here: I’m employed in a law school, and so I should be writing about my research in law. In writing about other topics, I reduce my cachet as a legal scholar. 1. It helps to build the habit of writing: Writing is often hard. I don’t know why this is, but it is. Academics (and others) often struggle with their writing projects. I know I do. One thing that blogging has helped me with is building a regular habit of writing into my daily routine. So much so that I now miss it if I don’t write for a couple of days. There is a downside to this too. Blogging is highly addictive form of writing, but I think that is outweighed by the upside. 2. It helps to generate writing flow states: I appreciate that the term “flow” state is something of a buzzword. Still, it has a basis in psychological science and it is something that blogging can help generate. The psychological barriers to writing a blog post are much lower than the psychological barriers to writing an article for peer review. Yet, when writing the former you can get into a flow state that can then be leveraged into writing the latter. Many is the time that I have finished writing a blog post and jumped straight into writing a more serious article. 3. It helps you to really understand your area of research: This is a big one. Before I started this blog I don’t think I really understood the arguments and ideas I was reading about in my research. It was only when I tried to explain those ideas to others, through my writing, that I saw exactly why the ideas were important, how the arguments were built, and where their flaws were located. 4. It allows you to systematically develop the elements of a research article: This is also a big one. 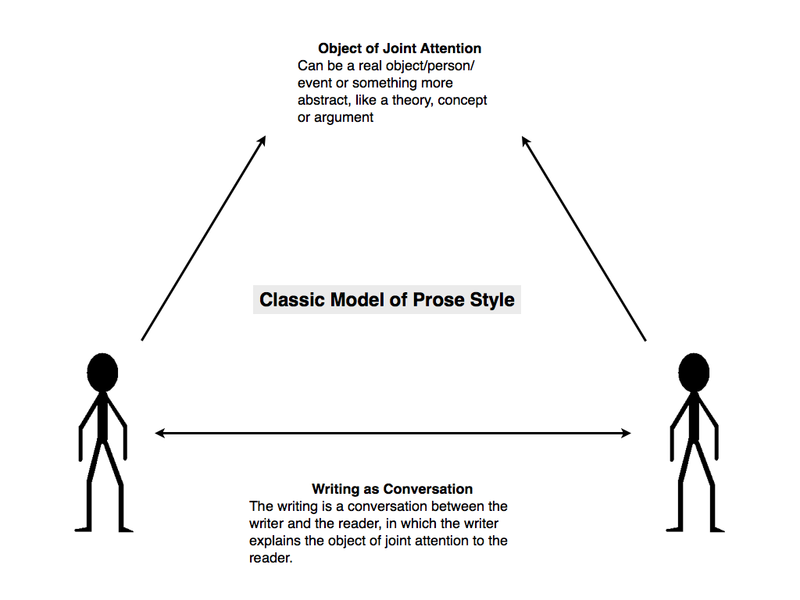 One of the main ways in which I have leveraged this blog into my academic work is by using a series of blog posts to develop the understanding and analysis I need to write a peer-reviewed article. The best example of this might be the article I published in Neuroethics last year, entitled “Hyperagency and the Good Life — Does Extreme Enhancement Threaten Meaning?”. That article was a systematic analysis and critique of so-called hyper agency objections to the enhancement project. The centrepiece of the article is a critique of four different authors, along with an endorsement of two others. The work of every one of those authors was originally the subject of one or more blog posts. Each blog post was a standalone, nevertheless they each helped to build the final product. I have done this on other occasions too, though maybe in less obvious ways. 5. It enables you to acquire serendipitous research interests: In addition to using the blog in a systematic way when writing peer-reviewed articles, I have also found it helps to develop serendipitous interests, which can later be used in peer-reviewed articles. There are actually several examples of this on this blog. One would be my article from Criminal Law and Philosophy entitled “Kramer’s Purgative Rationale for Capital Punishment: A Critique”. The idea for that article originally came from a two-part overview of the book that I wrote on the blog. Similarly, my article in the International Journal for Philosophy of Religion, entitled “Skeptical Theism and Divine Permission: A Response to Anderson”, was made possible by a series of posts on the topic of sceptical theism. At no time in the original writing of these posts did I think they would lead to peer-reviewed publications. And yet that’s exactly what happened. 6. It helps with networking and developing contacts: The blog posts I write follow a common structure. I read somebody’s article or book and then I write about it. Sometimes what I write is laudatory, sometimes it is critical. Either way, the people I write about tend to appreciate it and many get in contact with me as a result (I have rarely contacted them). This has led to a number of useful discussions, invites to give talks, and it has helped me to develop a network of people who are interested in similar topics and are willing to give feedback on the articles I’m trying to write for peer review. Thus, for example, without this blog I would not have got in touch with people like Felipe Leon, Brian Earp, Stephen Maitzen, Michael Hauskeller, Nick Agar and Nicole Vincent (among others) - all of whom have provided feedback on draft versions of articles I have subsequently published. 7. And yes, it also helps with teaching: It’s perhaps unfair to relegate this to last on my list, but that’s not intended as a reflection on its importance or significance. Blogging has really helped me to develop the in-depth knowledge I need for teaching. I don’t blog about everything I teach, but several of the subjects I have taught in the past have started life as blog posts. The best examples of this are, perhaps, my posts on the philosophy of mental illness and the ethics of prostitution, all of which provided material for classes I later taught. But these are just two examples. 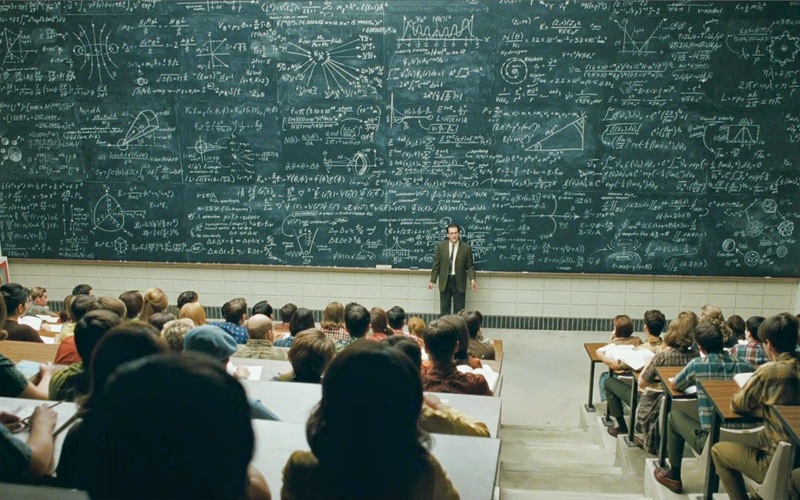 I couldn’t even begin to quantify the number of other posts I have used in my teaching. I should also note that I use the blog as a supplement to my classes. Thus, whenever it is relevant, I will direct my students to the blog to learn more about a given topic. Some have even been inspired to start their own blogs. As you might be able to tell, many of these reasons suggest that it is possible to avoid the “opportunity cost” problem highlighted by my peers. By using the blog in a somewhat instrumentalist way, you can actually kill two birds with the one stone. In other words, you can use blogging to support teaching and research, not as a distraction therefrom. This is the second and final part of my series about a recent exchange between David Chalmers and Massimo Pigliucci. The exchange took place in the pages of Intelligence Unbound, an edited collection of essays about mind-uploading and artificial intelligence. It concerned the philosophical plausibility of mind-uploading. The Consciousness Issue: Would an uploaded mind be conscious? Would it experience the world in a roughly similar manner to how we now experience the world? The Identity/Survival Issue: Assuming it is conscious, would it be our consciousness (our identity) that survives the uploading process? David Chalmers was optimistic on both fronts. Adopting a functionalist theory of consciousness, he saw no reason to think that a functional isomorph of the human brain would not be conscious. Not unless we assume that biological material has some sort of magic consciousness-conferring property. And while he had his doubts about survival via destructive or non-destructive uploading, he thought that that a gradual replacement of the human brain, with functionally equivalent artificial components, could allow for our survival. As we will see today, Pigliucci is much more pessimistic. He thinks it is unlikely that uploads would be conscious, and, even if they are, he thinks it is unlikely that we would survive the uploading process. He offers four reasons to doubt the prospect of conscious uploads, two based on criticisms of the computational theory of mind, and two based on criticisms of functionalism. He offers one main reason to doubt survival. I will suggest that some of his arguments have merit, some don’t, and some fail to engage with the arguments put forward by Chalmers. Pigliucci assumes that the pro-uploading position depends on a computational theory of mind (and, more importantly, a computational theory of consciousness). According to this theory, consciousness is a property (perhaps an emergent property) of certain computational processes. 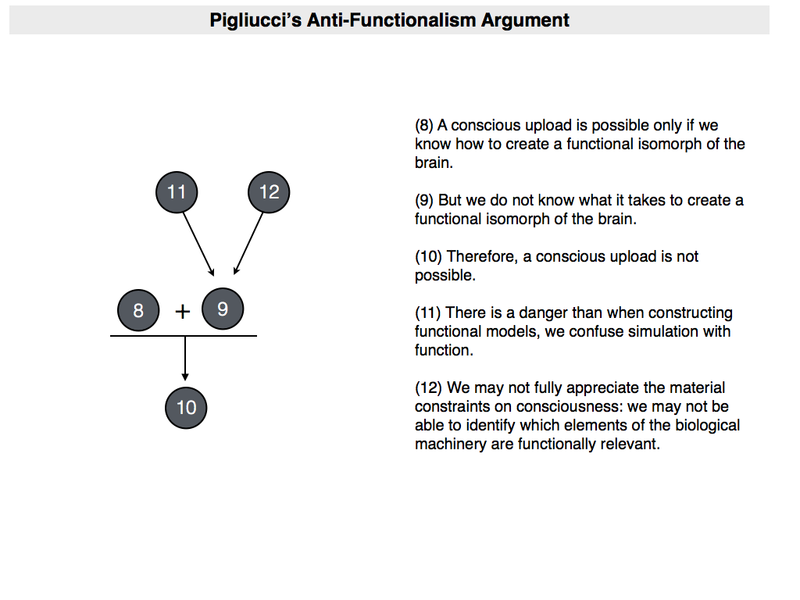 Pigliucci believes that if he can undermine the computational theory of mind, then so too can he undermine any optimism we might have about conscious uploads. (1) A conscious upload is possible only if the computational theory of mind is correct. (2) The computational theory of mind is not correct (or, at least, it is highly unlikely to be correct). (3) Therefore, (probably) conscious uploads are not possible. [Fodor distinguishes] between “modular” and “global” mental processes, and [argues] that [only] the former, but not the latter (which include consciousness), are computational in any strong sense of the term…If Fodor is right, then the CTM [computational theory of mind] cannot be a complete theory of mind, because there are a large number of mental processes that are not computational in nature. In saying this, Pigliucci explicitly references Fodor’s book-length response to the work of Steven Pinker, called The Mind Doesn’t Work that Way: The Scope and Limits of Computational Psychology. I can’t say I’m huge fan of Fodor, but even if I were I would find Pigliucci’s argument pretty unsatisfying. It is, after all, little more than a bare appeal to authority, neglecting to mention any of the detail of Fodor’s critique. It also neglects to mention that Fodor’s particular understanding of computation is disputed. 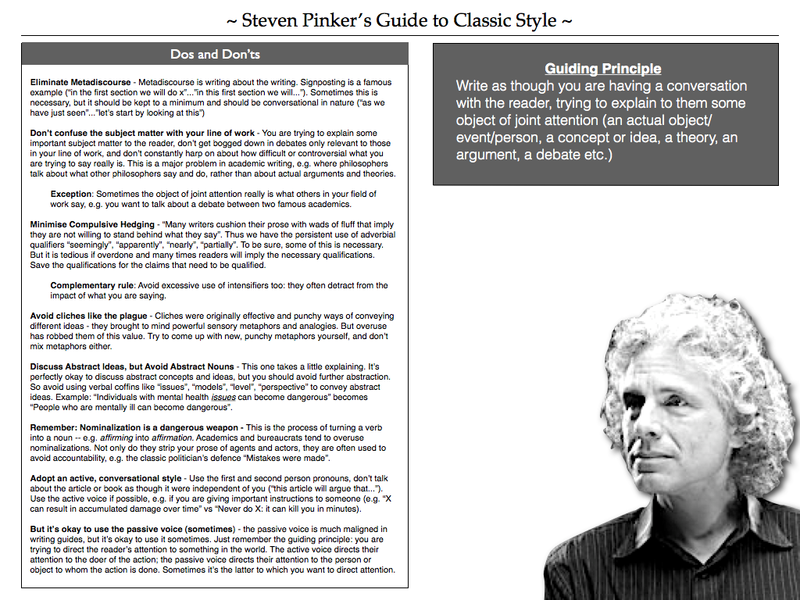 Indeed, Pinker disputed it in his response to Fodor, which Pigliucci doesn’t cite and which you can easily find online. 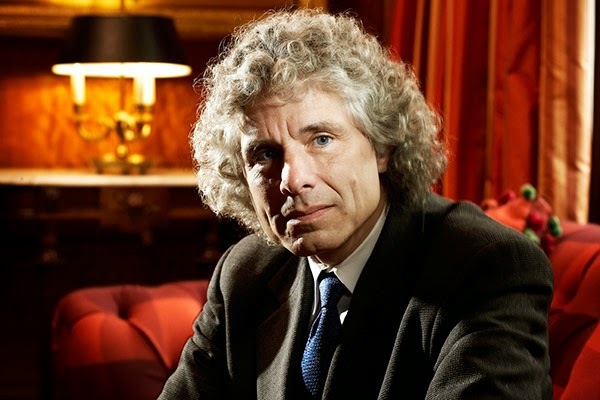 Now, my point here is not to defend the computational theory, or to suggest that Pinker is correct in his criticisms of Fodor, it is just merely to suggest that appealing to the work of Fodor isn’t going to be enough. Fodor may have done much to popularise the computational theory, but he doesn’t have final authority on whether it is correct or not. Let’s move on then to Pigliucci’s second reason to endorse premise (2). This one claims that the computational theory rests on a mistaken understanding of the Church-Turing thesis about universal computability. Citing the work of Jack Copeland — an expert on Turing, whose biography of Turing I recently read and recommend — Pigliucci notes that the thesis only establishes that logical computing machines (Turing Machines) “can do anything that can be described as a rule of thumb or purely mechanical (“algorithmic”)”. It does not establish that “whatever can be calculated by a machine (working on finite data in accordance with a finite program of instructions) is Turing-machine-computable”. This is said to be a problem because proponents of the computational theory of mind have tended to assume that “Church-Turing has essentially established the CTM”. I may not be well-qualified to evaluate the significance of this point, but it seems pretty thin to me. I think it relies on an impoverished notion of computation. It assumes that computationalists, and by proxy proponents of mind-uploading, think that a mind could be implemented on a classic digital computer architecture. While some may believe that, it doesn’t strike me as being essential to their claims. I think there is a broader notion of computation that could avoid his criticisms. To me, a computational theory is one that assumes mental processes (including, ultimately, conscious mental processes) could be implemented in some sort of mechanical architecture. The basis for the theory is the belief that mental states involve the representation of information (in either symbolic or analog forms) and that mental processes involve the manipulation and processing of the represented information. 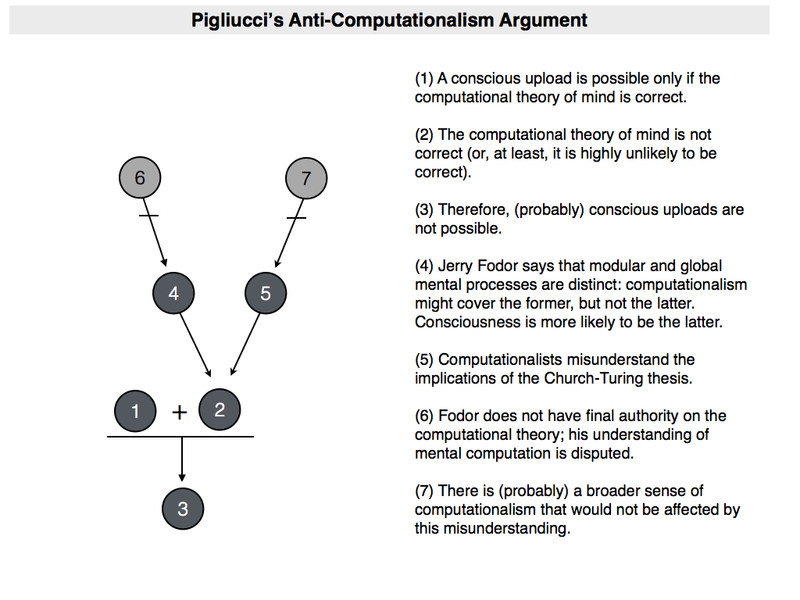 I see nothing in Pigliucci’s comments about the Church-Turing thesis that upsets that model. Pigliucci actually did a pretty good podcast on broader definitions of computation with Gerard O’Brien. I recommend it if you want to learn more. In summary, I think Pigliucci’s criticisms of the computational theory are off-the-mark. Nevertheless, I concede that the broader sense of computation may in turn collapse into the broader theory of functionalism. This is where the debate is really joined. And I think Pigliucci is on firmer ground when he criticises functionalism. Admittedly, he doesn’t distinguish between functionalism and computationalism, but I think it is possible to separate out his criticisms. Again, there are two criticisms with which to contend. To understand them, we need to go back to something I mentioned in part one. 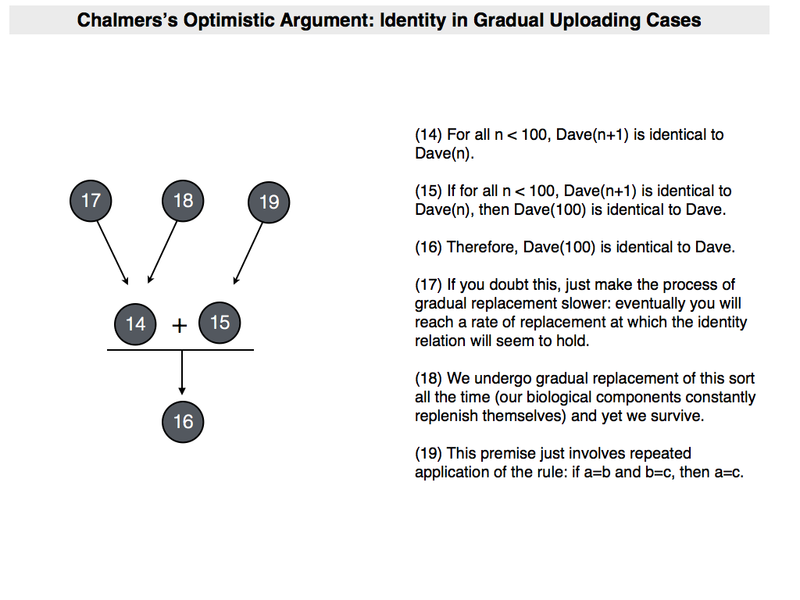 There, I noted how Chalmers seemed to help himself to a significant assumption when defending the possibility of a conscious upload. The assumption was that we could create of “functional isomorph” of the brain. In other words, an artificial model that replicated all the relevant functional attributes of the human brain. I questioned whether it was possible to do this. This is something that Pigliucci also questions. (8) A conscious upload is possible only if we know how to create a functional isomorph of the brain. (9) But we do not know what it takes to create a functional isomorph of the brain. 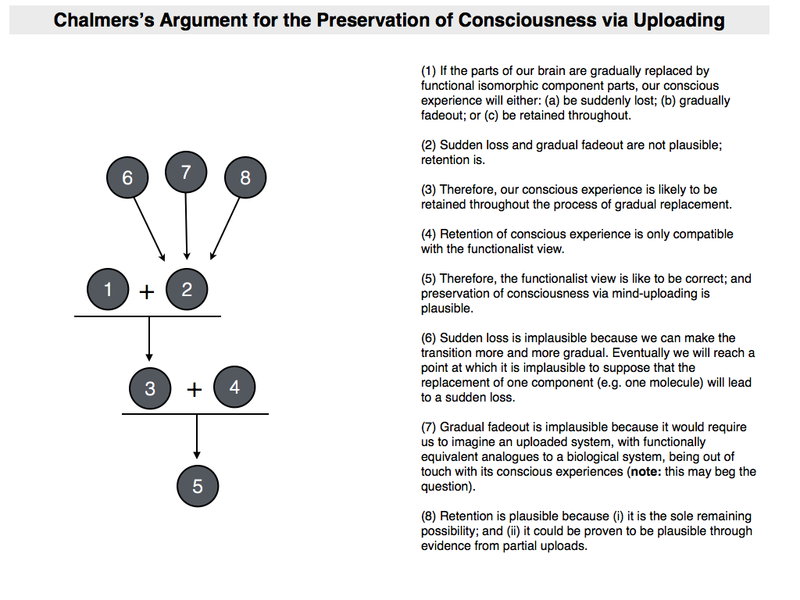 (10) Therefore, a conscious upload is not possible. Pigliucci adduces two reasons for us to favour premise (9). The first has to do with the danger of conflating simulation with function. This hearkens back to his criticism of the computational theory, but can be interpreted as a critique of functionalism. The idea is that when we create functional analogues of real-world phenomena we may only be simulating them, not creating models that could take their place. The classic example here would be a computer model of rainfall or of photosynthesis. The computer models may be able to replicate those real-world processes (i.e. you might be able to put the elements of the models in a one-to-one relationship with the elements of the real-world phenomena), but they would still lack certain critical properties: they would not be wet or capable of converting sunlight into food. They would be mere simulations, not functional isomorphs. I agree with Pigliucci that the conflation of simulation with function is a real danger when it comes to creating functional isomorphs of the brain. [This] scenario requires “only” a convincing (empirical) demonstration that, say, silicon-made neurons can function just as well as carbon-based ones, which is, again, an exclusively empirical question. They might or might not, we do not know. What we do know is that not just any chemical will do, for the simple reason that neurons need to be able to do certain things (grow, produce synapses, release and respond to chemical signals) that cannot be done if we alter the brain’s chemistry too radically. I don’t quite buy the analogy with life. I think we could create wholly digital living beings (indeed, we may even have done so) though this depends on what counts as “life”, which is a question Pigliucci tries to avoid. Still, I think the point here is well-taken. There is a lot going on in the human brain. There are a lot of moving parts, a lot of complex chemical mechanisms. We don’t know exactly which elements of this complex machinery need to be replicated in our functional isomorph. If we replicate everything then we are just creating another biological brain. If we don’t, then we risk missing something critical. Thus, there is a significant hurdle when it comes to knowing whether our upload will share the consciousness of its biological equivalent. It has been a while since I read it, but as I recall, John Bickle’s work on the philosophy of neuroscience develops this point about biological constraints quite nicely. This epistemic hurdle is heightened by the hard problem of consciousness. We are capable of creating functional isomorphs of some biological organs. For example, we can create functional isomorphs of the human heart, i.e. mechanical devices that replicate the functionality of the heart. But that’s because everything we need to know about the functionality of the heart is externally accessible (i.e. accessible from the third-person perspective). Not everything about consciousness is accessible from that perspective. After his lengthy discussion of the consciousness issue, Pigliucci has rather less to say about the identity issue. This isn’t surprising. If you don’t think an upload is likely to be conscious, then you are unlikely to think that it will preserve your identity. But Pigliucci is sceptical even if the consciousness issue is set to the side. [I]f the only difference between the two cases is that in one the original is destroyed, then how on earth can we avoid the conclusion that when it comes to destructive uploading we just committed suicide (or murder, as the case may be)? After all, ex hypothesi there is no substantive differences between destructive and non-destructive uploading in terms of end results…I realize, of course, that to some philosophers this may seem far too simple a solution to what they regard as an intricate metaphysical problem. But sometimes even philosophers agree that problems need to be dis-solved, not solved [he then quotes from Wittgenstein]. Pigliucci may be pleased with this simple, common-sensical solution to the identity issue, but I am less impressed. This is for two reasons. 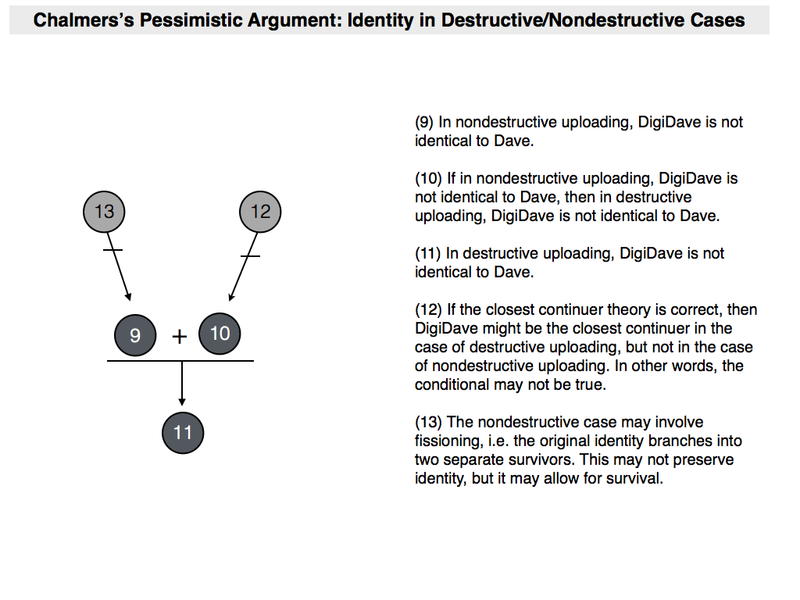 First, Chalmers made the exact same argument in relation to non-destructive and destructive uploading — so Pigliucci isn’t adding anything to the discussion here. Second, this criticism ignores the gradual uploading scenario. It was that scenario that Chalmers thought might allow for identity to be preserved. So I’d have to say Pigliucci has failed to engage the issue. If this were a formal debate, the points would go to Chalmers. That’s not to say that Chalmers is right; it’s just to say that we have been given no reason to suppose he is wrong. 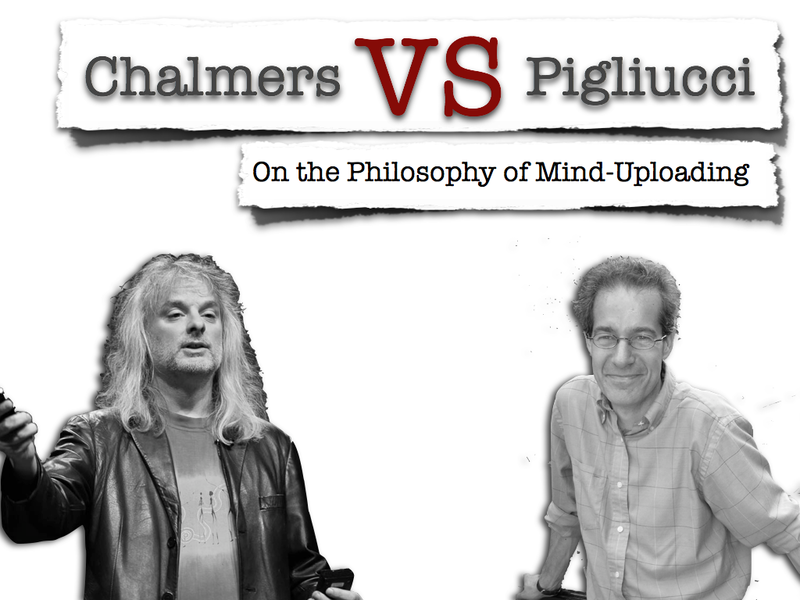 To sum up, Pigliucci is much more pessimistic than Chalmers. He thinks it unlikely that an upload would be conscious. This is because the computational theory of mind is flawed, and because we don’t know what the material constraints on consciousness might be. He is also pessimistic about the prospect of identity being preserved through uploading, believing it is more likely to result in death or duplication. I have suggested that Pigliucci may be right when it comes to consciousness: whatever the merits of the computational theory of mind, it is true that we don’t know what it would take to build a functional isomorph of the human brain. But I have also suggested that he misses the point when it comes to identity.